For this month's "Maps Of The Month" featurette, I wish to draw your attention to TerraEsperZ's Battletoads (NES) maps. Ah, Battletoads. Rare's answer to the TMNT craze. Zitz and Rash, two of the three Battletoads, must rescue Princess Angelica and their teammate Pimple from the evil Dark Queen. That's a good enough reason for some amphibian action! ...Make that aggravating action. Some NES games are well-remembered for being quite difficult, and undoubtedly Battletoads is one of the most infamous in that regard. There are over a dozen stages, but I'm pretty sure very few people can get past the third stage. And that's a shame. The stages are quite varied; there's some platforming, rappelling, racing, surfing, riding on the backs of giant snakes, and a high-speed gravity-defying unicycle chase with a hypno-ball-thing on your tail. This game has it all! If you've never seen all of this game (as I imagine most people haven't) and its awesome graphics (the usual bright neon colours found in many Rare-developed NES games are actually well-balanced here), you can see for yourself here on VGMaps.com and save yourself the trouble of mastering the Turbo Tunnel. Check out the labyrinthine Terra Tubes - no doubt one of TerraEsperZ's favourite stages based on name alone. I almost didn't want to honour TerraEsperZ again, after all, this is his eighth recognition in as many years. But I could not ignore the awesomeness of the animated "The Revolution" stage. We have a few other animated maps on this site, but none with the size and complexity as the penultimate stage of Battletoads. Absolutely mesmerizing. Sorry, that friend of a friend of yours, the only guy you know of that's claimed to have beat Battletoads, has got nothing on TerraEsperZ, who's mapped every angle of the Dark Queen's rotating tower. 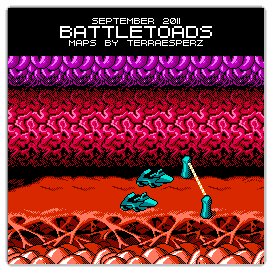 So to recognize the difficulty put into mapping this infamously difficult game, TerraEsperZ's Battletoads (NES) maps will be known as VGMaps.com's Maps Of The Month for September 2011. This is certainly the oldest project I've completed so far, having been in the making for over four years. I remember a hard drive crash being responsible for the initial suspension of the project, which I had to restart several times to finally see it through. I can honestly say that this is one of the few NES games out there that are actually a real challenge to map properly. I mean, the game engine probably changes with every stage, with things like parallax scrolling and just plain horizontal and vertical scrolling coming and going on the whim of the game coders. This game is also probably the one that made me try my best to 'hack' the camera position through memory cheats to capture those areas that you simply cannot reach during normal gameplay. This came in handy in mapping the full vertical height of Level 5 - Surf City since vertical scrolling is normally automatic and can't be controlled. It was also instrumental in finally revealing to the world what exactly was located above the stating point in Level 11 - Clinger-Winger and a nice little tidbit that isn't visible on the final map, that the layout for Level 13 - Armageddon is actually located in the empty space under that same starting point (they just change the palette for that part but you can clearly see that it uses the same tilesets). I remember guessing a lot during my earlier projects to fill in empty space but I've been trying as much as possible to avoid that and so far, I'm pretty successful. The only stage that was a real challenge to render is of course Level 12 - The Revolution and I can say it's one of the individual maps I'm the most proud of. And funny enough, it allowed me to use what little knowledge I retained from high school trigonometry to achieve the best rotation possible (the game itself is actually a few pixels off for some angles). It took a long time to assemble despite using a ton of templates in MS Paint to easily paste everything in the correct position as quickly as possible, but I think the final result was worth it. I personally would have made the rotation much smoother than it ended up being but then the file size would have been even more horrible (it's already 4.8 MB big) and it would have taken 4 or 8 times longer to do! I'm only human you know, and even I'M not that big a masochist.